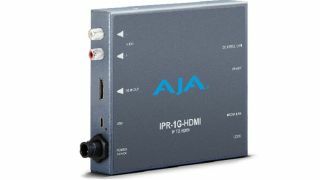 AJA Video Systems has released IPR-1G-HDMI, a new Mini-Converter designed to convert JPEG 2000 IP video and audio streams to HDMI. IPR-1G-HDMI converts VSF TR-01 and other JPEG 2000 over MPEG2-TS formats for output on a full-size HDMI 1.4 interface. The rugged, fanless Mini-Converter supports a range of HD and SD formats, and is designed for several point-of-use applications -- including source monitoring, digital signage and video walls. IPR-1G-HDMI is available now for a US MSRP of $795. For more information, please visit: https://www.aja.com/en/category/mini-converters .